A student of mine has just lent me a baritone sax and I got it out today for the first time to have a blow. The case is the size of a small car and I can't see myself peddling around with this beast under my arm like I did with the tenor. It takes up a deal of space and I can appreciate why its owner, who had another one at home, was so happy for me to take it off his hands for a while. 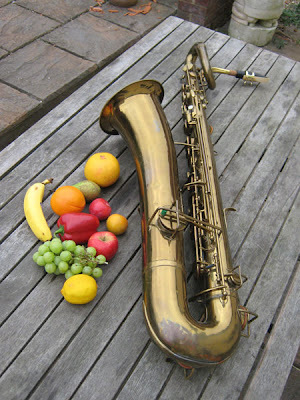 The fruit in the picture was to give a sense of scale but I got carried away with the theme and so it's 'Still Life with Saxophone' in tribute to Tom Robbins. 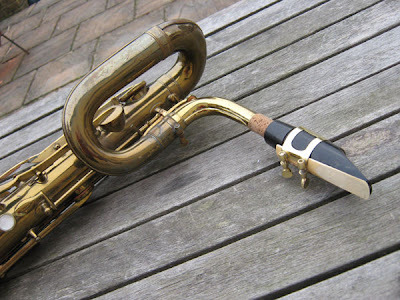 This sax inevitably made me think of other big saxophones. I have come across three memorable bass saxes in my time. 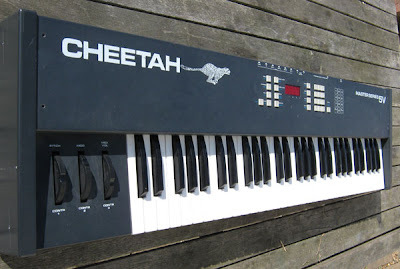 The first was played by Rodney Slater of the Bonzo Dog Band but I had no idea what it was when I saw them on the telly. The next was at a party in an enormous house in Hampstead Heath. There was a nine-piece Dixieland jazz band in one of the reception rooms and they found it impossible to resist the wine - plentiful and free-flowing - that the host had provided for his guests. I got talking to the player of a magnificent bass sax and discovered he was drunk enough to let me have a go (but sober enough to insist I kept in on the stand while I played). To get the full flavour of times you really need to read Škvorecký's book but the above is a reminder of how lucky we are in the freedoms we enjoy. Or how unlucky we are to live in such undisciplined times. Take your pick. I was discussing a music-making project that aims to involve children and young adults who may be described as being on the fringes of society. It was taken, almost as a given, that the emphasis would be on 'popular' music because it is so much more accessible. We accepted that classical music, although wonderful in itself, was unlikely to be the best starting point. It is not impossible to interest children, especially the very young, in the great composers of orchestral music but their initial interest is more likely to be fired by something more familiar. Possibly the best purchase my father ever made was the Readers' Digest 'Festival of Light Classical Music', a 12 album boxed set. This introduced me to Tchaikovsky, Bizet, Borodin, Mendelssohn, Elgar, Verdi etcetera, etcetera. At the time I was unconcerned by the quality of sound reproduction which must have been dreadful. I had never been to a live concert and the piano we had once owned was never played so I had nothing to compare it to. No doubt a purist would have taken issue with the validity of my experience but for me it was sufficient to inspire a life in music. 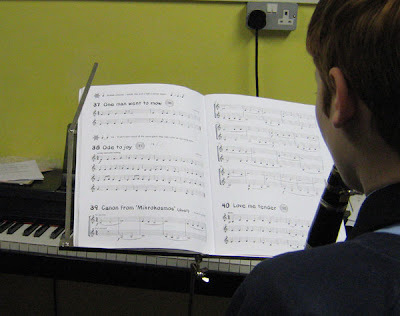 Fast forward four decades or so and I am teaching a child of twelve to play Beethoven's Ode to Joy on the clarinet. "You might recognise this," I tell him. "It's the anthem of the European Union." (Actually, in Britain at least, that appears to be a little-known fact.) He begins to play and tells me he does indeed recognise the tune. I confess I felt somewhat put out by this revelation. Back in the 1970s one of my favourite actors, one Terry Thomas, destroyed my enjoyment of a piece from The Nutcracker Suite by singing a lyric in praise of Cadbury's Fruit and Nut (chocolate). [The link is to a Frank Muir version.] Much worse has happened since and listening to a cheap and synthetic rendering of Mussorgsky's Promenade when put on hold is right down there with old TT. Yes, I could have condemned this outrageous misappropriation of one of the greatest tunes of the 19th century. But I didn't. Just as my first introduction to great music came through an old box that would have horrified the composers whose music it approximated; just as my first hearing of Pictures at an Exhibition (to which Promenade forms the introduction) came via Emerson Lake and Palmer; so there is no telling what will inspire the children of today to listen to great music and seek its source. The fact that Ode to Joy still sounds memorable as a ringtone is testament to its enduring quality. Maybe Terry Thomas inspired some great musicians to become what they are today (maybe...) and it is finally time to forgive, nay to praise, him. I remember, aged about ten, hearing my father rail against the tuneless racket emanating from my teenage brother's bedroom. Personally I like Bob Dylan but I do have some sympathy for my father's point of view. The guitar playing is tuneful enough but the vocal style, like English ale, is an acquired taste. And Dylan's harmonica playing is worth a post of its own, if not a whole book. People say we turn into our parents. At sixteen I would have dismissed that suggestion out of hand but as I get older I am at least reminded of my father by parallel situations. He had three sons, I have three daughters. He had Dylan, ELP and The Beatles coming out of three different rooms to create some kind of sonic porridge in the hall. He couldn't have identified any of the constituent parts of this din, partly because it was all too alien to him but mostly because he had no interest in learning our language(s). Strangely enough, and disappointingly really, I find the music my children play highly accessible. (Maybe that's because girls use clothes, more than music, to explore and express their identities.) I followed developments in music reasonably closely into the early 90s and have maintained an interest in more esoteric sounds since then. The music my children play often sounds like an aural equivalent of a DIY pizza; the combinations occasionally surprise and delight but the ingredients are very familiar. What reminds me of my father, however, is not recorded music from all quarters mixed with occasional acoustic piano. It's not even the bleep, bleep, bang, whizz of computer games. None of this is remotely anarchic or threatens to shake the foundations of my 20th century value system. In fact it's all rather bland in a way that Jimi Hendrix certainly wasn't back in 1969. And that last one is the worst. Like many, I find it hard to ignore a telephone unless it belongs to someone else. 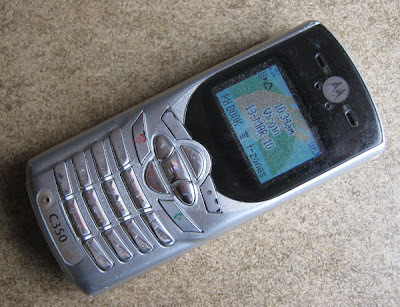 I am not a willing convert to the mobile phone but since acquiring one my children, from time to time, decide I should change my ring-tone. I'm sure this is done to protect me from sounding un-cool and I am suitably grateful. However, my gratitude is tempered by irritation at their failure to notify me of these updates. So have we arrived at some kind of Tower of Babel where sounds fly around whose meaning is known only to their makers? Or is it, as I suspect, that I am turning into a grumpy old man unwilling to learn these new languages? If music really is the universal language it has certainly been misappropriated, in my humble opinion, and that, along with Dylan's harmonica playing, is the subject of a future post. At the end of the singing competition I went to last week the chief judge got up to speak to the audience and give her feedback to the choirs. She told us how she refused to judge competitions but enjoyed coming to Norwich to judge this one because it wasn't a competition. The problem with competitions, apparently, is that they can be very discouraging when all the choirs really want is some constructive feedback. And then came the feedback, which was constructive, followed by the results. 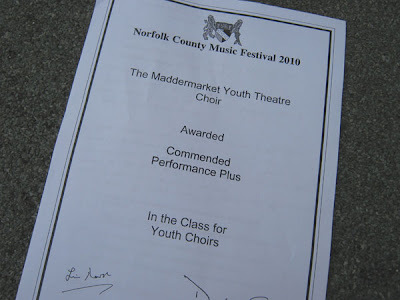 One choir got 'Commended Performance Plus', another 'Highly Commended' and another achieved 'Highly Commended Performance Plus' while the remaining entrants were given one of these. No choir was deemed to have achieved 'Outstanding'. If the object of this was to allow a head teacher to stand up in assembly and tell the school how well their choir did in the Festival then it succeeds very well. No one has to say their choir was beaten by the school around the corner. If, on the other hand, it hopes to disguise from the children how they got on in the 'not' competition then I'm afraid it may have failed. My daughter knew straight away that her choir came last. Dressing numbers up as words wasn't enough to pull the wool over her eyes. Fortunately it didn't seem to bother her or her fellow choristers - they were in it for the fun. The hard knocks and disappointments in education are often defended as 'preparation for the adult world'. I'm very glad the open-mic sessions and mixed, cabaret-style, events I sometimes play at aren't judged in this way. Yes, the feedback may be useful but as for the rest, I know if it's gone well or badly and the audience usually gives a fair indication of that, too. And speaking of the audience, the troop from Suffolk, presumably with the fewest parents in attendance, were the most enthusiastically applauded in spite of only coming joint second. A friend of mine sent me a video yesterday. It shows an amazing machine that sends balls, presumably using air pressure, in the manner of a tennis serving machine. These hit various pieces wood and metal and even strings to produce a very listenable jazz-rock score. According to the accompanying blurb the machine is made from components used in farm machinery, is displayed at the University of Iowa and is to be donated to the Smithsonian. 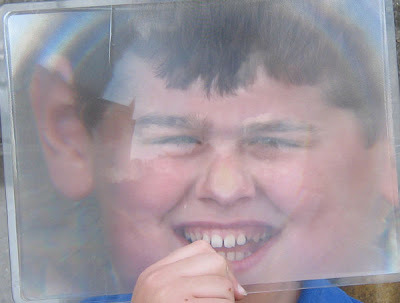 Watching a small image on my computer I was taken in for a while. It is still a wonderful piece of work and well worth watching but is actually a CGI animation. If you would like to see it in Real Player or similar send me your email (email me via my website if you'd prefer) and I'll send it on. It seems to be doing the rounds as a hoax so hopefully I'm not offending anybody's copyright. 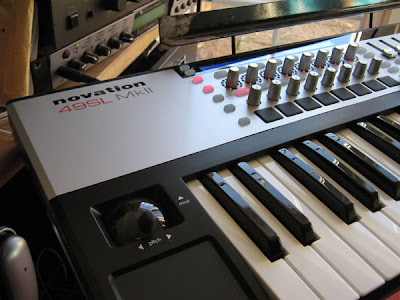 It is a remarkable 'invention', makes jazz-rock accessible and will, I am sure, inspire some real instruments in a similar vein. Enjoy. I suppose anything that gets people singing is, by definition, 'a good thing' and therefore be spared any criticism. So I should stop there really, perhaps just pausing to express my genuine admiration for those who put their spare time into running choirs. 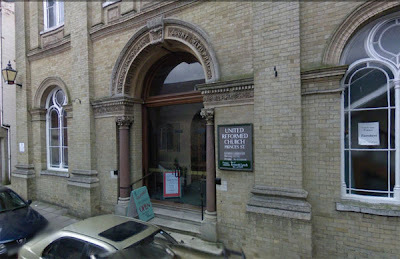 Last week I went to see a singing competition in a church in the city centre. It wasn't supposed to be a competition but more on that later. I normally avoid such affairs but my daughter was in a theatre choir that had entered the not-a-competition for the first time. I didn't stay for the second half as she needed to get back to be ready for an early start the next day but I saw all five acts in the first half. First up was the junior choir from a rural area of Norfolk. The repertoire was almost exclusively religious, by which I mean Christian. No harm in that of course but if it hadn't been for the clothes it could have been the 1950s which was probably the era of both the conductor and accompanist. The theatre choir came next with 'Ave Verum Corpus' and a sweet arrangement of 'Cant Take My Eyes Off You'. And then the rural choir's seniors came on with 'Danny Boy' - a maudlin dirge if you ask me but beautifully sung and well suited to the room's acoustics - and two songs of praise. Less suited to the acoustic was 'Fascinating Rhythm'. I was upstairs in the gallery and the notes were playing pinball around my ears. Occasionally I see something that makes me think 'Only in Norfolk...' and it usually involves a well-meaning attempt to recreate something from another culture. Watching this choir try to jive along to the Gershwin number and, later, to 'Down by the Riverside' reminded me that Norfolk is probably one of the few places on the planet where you will find people still clapping on the downbeat. Classical musicians really can't swing and it seems traditional choirs struggle too. It put me in mind of 'Can Blue Men Sing the Whites' by the Bonzos but I'm sure it was good enough for the doting mums and dads in a church in Norwich. So a breath of fresh air, and a complete surprise, when a choir from rural Suffolk took to the stage with 'African Sanctus'. I've always loved this song since seeing the 1968 film 'If' starring Malcolm McDowell. McDowell had a good line in brooding obsessives, most famously Alex in 'A Clockwork Orange'. Here he plays a revolutionary schoolboy in an English public (meaning exclusive and private) school. The choir did this very well and followed it with a South African song sung in one of the native languages. It turned out that their conductor/leader was from South Africa. 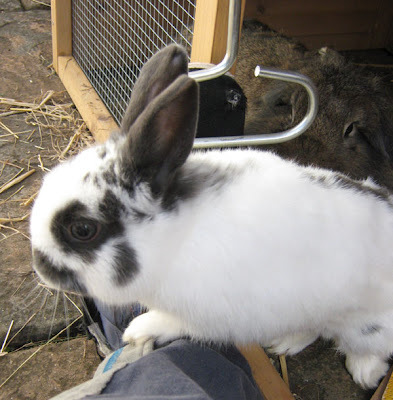 My partner is a dancer and wasn't hugely impressed by their attempts to move along to the music and get themselves on and off stage in an authentic fashion but it worked for me. And finally the rural Norfolk choirs combined for a mixed choir. More of the same really. They were good at what they did but I had seen and heard enough of them. That's not their fault. The fact that only three choirs, in truth, had come along to the first half speaks volumes. I don't know how many made the second half but probably not many. And that is why, for all the 'like punk (or even Suez) never happened' ethos, it is very definitely 'a good thing' and should be applauded. With the possible exception of John Adams I have never been a particular fan of opera. There is no denying the emotional intensity, the skill of the composers and musicians and the sheer power of the singers. Opera is truly awesome but I'm afraid it is largely wasted on me and it occupies a place in my mind adjacent to Heavy Metal. But there is hope for me yet. In the same way that an unfamiliar sport becomes more interesting when the rules are explained, my appreciation of opera has recently increased through greater understanding. 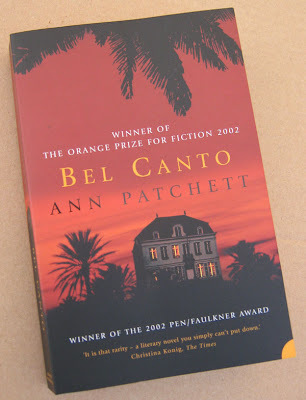 During the half term break (how long ago it seems now) I read Bel Canto by Ann Patchett. The plot centres around a hostage 'situation' in an unnamed American republic. Among the captives is a renowned soprano. For a number of years I kept up a subscription to The Wire largely because I enjoyed reading the reviews of obscure pieces of music I knew I was never going to hear. My pleasure came from imagining what the music would sound like and the descriptions made it spring to life in my head. Bel Canto contains some of the most evocative descriptions of music I can remember reading. Here's a short extract. "There should have been an orchestra behind her but no one noticed its absence. No one would have said her voice sounded better with an orchestra, or that it was better when the room was immaculately clean and lit by candles. They did not notice the absence of flowers or champagne, in fact, they knew now that flowers and champagne were unnecessary embellishments. Had she really not been singing all along? The sound was no more beautiful when her voice was limber and warm. Their eyes clouded over with tears for so many reasons it would be impossible to list them all. They cried for the beauty of the music, certainly, but also for the failure of their plans. They were thinking of the last time they had heard her sing and longed for the women who had been beside them then. All of the love and the longing a body can contain was spun into not more than two and a half minutes of song, and when she came to the highest notes it seemed that all they had been given in their lives and all they had lost came together and made a weight that was almost impossible to bear. When she was finished, the people around her stood in stunned and shivering silence. Messner leaned into the wall as if struck. He had not been invited to the party. Unlike the others, he had never heard her sing before." It's a very good book all round, winning the Orange Prize in 2002 (when my kids were much younger and time/space for reading harder to come by. If you like a good story, string characterisation and a musical thread or two then you could do far worse. 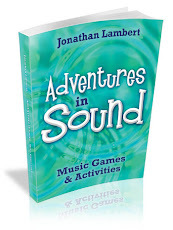 For those who don't yet know, I post a new music/sound game on my website at the beginning of each month. This month's is called Call My Name and is good for developing rhythm skills, good for developing listening skills and, well, just good fun. It's absolutely free so be my guest and take a look. It's aimed at players from nine years old to adult and should keep your group amused and productively engaged for five or ten minutes at least. From that page you are just a click away from several other games that are permanent features of the site. Again, these are free to play and completely without obligation.